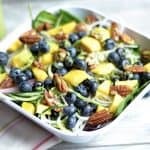 Blueberry and Mango Spinach Salad with Basil Vinaigrette is bursting with fruity and tangy flavor! A simple salad that is perfect for a side dish or lunch salad. Paleo and Gluten-free, with a Vegan option. And it’s so pretty……Brunch anyone? I am salad obsessed. Always trying to come up with a new seasonal variation of my favorite food. With a batch of my Sweet Basil Vinaigrette sitting in the fridge, and some gorgeous blueberries discovered at the store, I knew these two would pair well on a miserable rainy afternoon May day. Ughhh. Just wanted to make a brief mention of how irritating and wet it has been in my town. Moving on….. 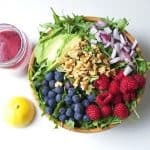 This salad was made to brighten up the day and get me excited for warm weather just around the corner! As you can tell, I also got spiral happy with my veggies. I have a new spiralizer that has changed my life for the better. Gorgeous thick vegetables in the form of thin strips is much better than chopping chunks! So yes, I spiralized a red onion and cucumber here. Not required, but look beautiful when serving to a crowd. 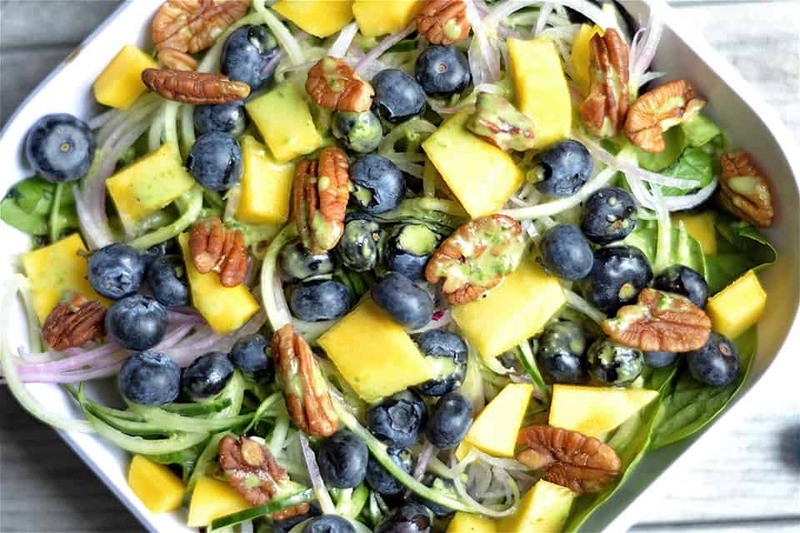 The sweetness of blueberries and mango pair so well with the salty pecans, and give the salad a perfect texture! 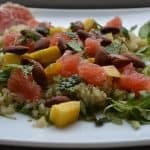 This salad is perfect for a warm summer or spring night, served with anything off the grill (salmon, chicken, steak, etc.). I happen to enjoy this for my lunch the other day, and plan to make it for our next gathering with friends! Layer your salad beginning with the spinach (or greens). 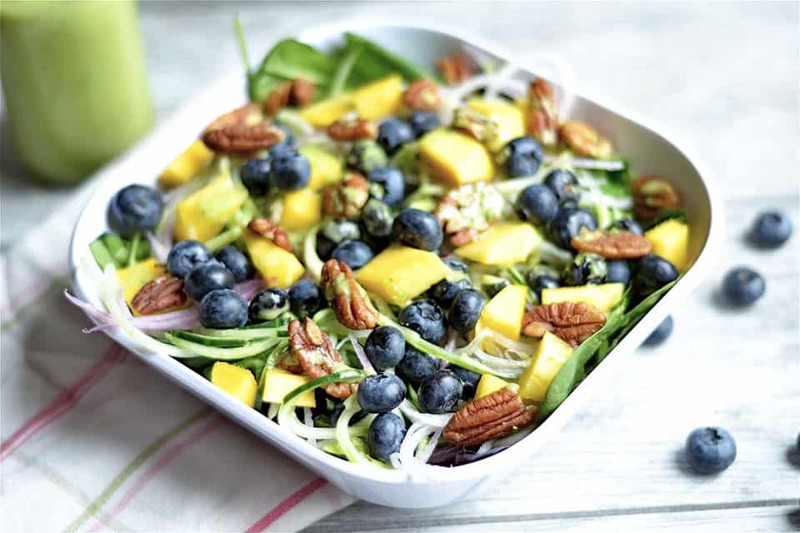 If using a spiralizer, spiralize cucumber and red onion, and place on top spinach. 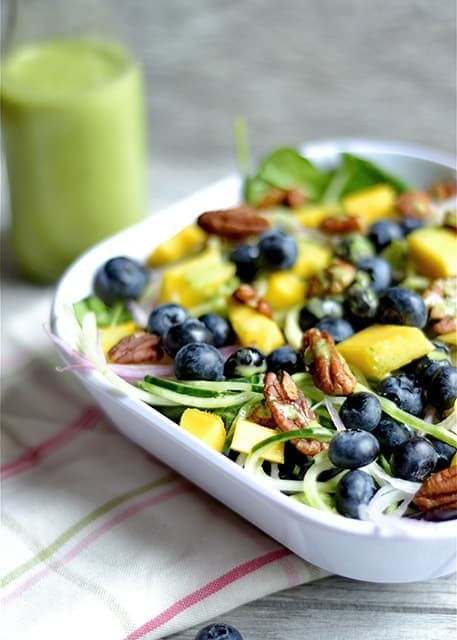 Top with blueberries, mango, and pecans. Set aside. 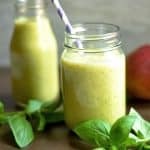 Prepare dressing: Place all ingredients into a blender or food processor, and pulse until smooth. 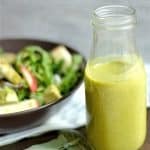 Toss salad dressing with salad, extra dressing can be stored in the fridge for up to 2 weeks. This salad is out of this word amazing! It was my first time using blueberries in a salad and was quite skeptical about it. I don’t own a spiralizer, used dried basil, onion and garlic instead of fresh and dry-roasted the pecans in a pan for a few minutes. This is truly the food of the gods! Thanks Angela! So glad you loved it! This salad is absolutely delicious! Definitely one of my favorites. Thank you! This was so good. Thanks for sharing the recipe. I’ll definitely make it again.